On March 22, 2019, in his 97th year of life, Raffaele Chimienti died quietly with family by his side. He is survived by his beloved wife of 65 years, Laura (nee Racanelli). He was a faithful father to his five children, Franca, Angelo, Carmela, Rita and Antonietta. Raffaele was a kind father in law to Cathy, Ed, Steve and Nick. 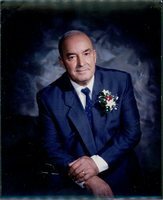 He was a beloved grandfather to his five grandchildren, Joseph, Alexandria, Brenna, Maggie and Amanda. Raffaele leaves behind his nieces and nephews, Domenica (Nella), Rosa, Vito, Laura, Angela, Mary, Rita, Rose, Suzanne, Vincenzo, Michele, Vito, Tina and Raffaele. Also his friend and brother in law Michele, sisters in law Maria and Domenica. He will join those that have passed before him: his beloved infant daughter Franca, his parents Laura and Angelo Santo; his sisters Lucia and Domenica and brother in law Francesco. We live in hope that Raffaele is now living in God’s heavenly garden filled with bountiful fruits, vegetables, grape vines, and fig trees with those that he loved. His memory will live in our hearts. IN LIEU OF FLOWERS, DONATIONS TO THE ST. VINCENT DE PAUL SOCIETY WOULD BE GREATLY APPRECIATED BY THE FAMILY. Donations are being accepted for: SOCIETY OF ST. VINCENT DE PAUL, TORONTO CENTRAL COUNCIL.